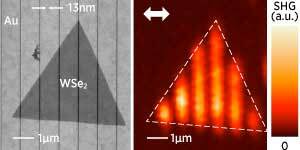 (Nanowerk News) By combining two very different light-interacting nanostructures, A*STAR researchers have demonstrated a surprisingly strong enhancement of a frequency doubling effect (ACS Nano, "Selectively plasmon-enhanced second-harmonic generation from monolayer tungsten diselenide on flexible substrates"). The functional manipulation and transformation of light in optical circuits is an exciting area of research that combines the physics of light and matter in unusual ways. At the cutting edge of this technology, researchers are exploring new structural combinations of materials that could give rise to potentially useful functions, particularly in nanoscale systems. Joel Kwang Wei Yang, Zhaogang Dong and their colleagues at A*STAR’s Institute of Materials Research and Engineering have been working on highly precise techniques for patterning thin gold films with nanoscale groove structure to enhance light interaction and produce light resonance effects known as plasmonics. In collaboration with researchers from the National University of Singapore, Imperial College London and the King Abdullah University of Science and Technology in Saudi Arabia, Yang and Dong fabricated, analyzed and modelled a system consisting of the nano-grooved gold film topped with an atomically thin flake of tungsten selenide (WSe2). The result was a remarkable 7,000-fold multiplication of an effect called second harmonic generation (SHG), by which two photons combine to produce a single photon with double the energy (or frequency). Notably, the sample survived both the transfer onto a separate transparent substrate and many bending cycles without degradation in SHG emission, making it a potentially resilient and versatile platform for further development.